Our website had been due for a revamp for a very long time, but it’s finally here. 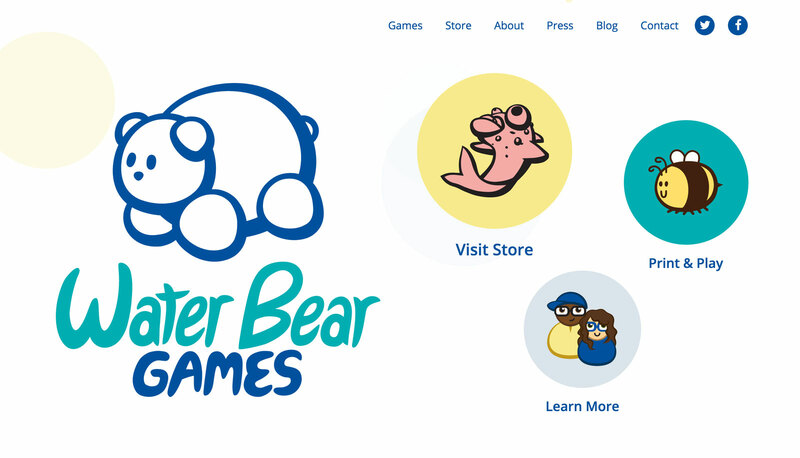 Since I first created the Water Bear Games website in 2013, I’ve become a better designer and developer, and our old website was slowly killing me inside. We’ve also changed so much since those days. We’re no longer just free print-and-plays, and while print-and-plays are still important to us, it’s not all we are anymore. We have one game that’s published and hope to have more on the way soon, and I feel like this is now a website that can grow with us. I’ve actually been working on this site off and on for about a year. When I first started working on it at the beginning of 2015, I knew I wanted to create a website that really told our story and reflected who we are as people and as a company. Throughout the Tabletop Deathmatch and even today, it feels like not only do our fans like our games but for some reason they really love us, as people. So with this new website I really wanted to emphasize talking about us and our story and have fun with that. In the first version of this website, I changed the look entirely, but I never actually took the time to design it. I was just making up the look as I coded, and then I set the website aside for months, and when I came back to it I didn’t like it anymore. So the version that you see today, I actually allotted time to designing it, and I think it came out really well. Marcus also suggested that while I was revamping our website, I may as well redo our logo. He had never been a huge fan of it; he felt like the plain, regimented sans serifs looked too corporate. To be honest I had designed our original logo in about a half hour during Startup Weekend 2012; I spent so little time on it because we were also creating an entire game in a weekend and I spent the rest of my time drawing an elaborate space illustration for the board, ten cats, ten planets, and a dog, as well as designing the cards, board, and player pieces. The only creative direction Marcus gave me for the new logo was he wanted it to look more “fun” (he basically just lets me do whatever I want with Water Bear Games’ art). There aren’t many “fun” script fonts that I like, so I actually created the type completely from scratch. We love our unrealistically adorable water bear, so he needed to stay. I knew I wanted to keep the general bubbly, simplistic feel of the water bear from the old logo, but wanted to update his look just a little. I tried a lot of different things before deciding to keep the pose simple like the original. I increased his line weights to look more deliberate and match the weight of the type, and also made him more believably three dimensional. Finally, I updated Water Bear Game’s color palette. I’ve never been a fan of our old blue. I think in the mayhem of Startup Weekend I literally just picked a default blue swatch in Adobe Illustrator and went with it. These blues are more playful, and we also have an official yellow for occasional accents (because Marcus’s favorite color is yellow) as well as an official gray. Alright, I think that’s everything new with Water Bear Games as a brand. Hope you guys are enjoying the new website and all the cool new stuff to look at!